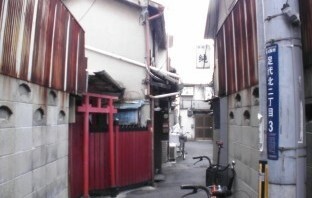 As I'm much interested in visiting small shrine in Osaka, I always check it by Web surfing. One day I found a picture which shows the remains of Inari-Jinja(shrine). The picture was used on someone's website and it was taken in Higashi-osaka. Looking at the picture carefully, it showed detail address on it. I tried to check it on Google Map because I wanted to see actual image of the shrine. However, Google Map did not indicate the position correctly. I thought that Google Map was not able to show a right position because the shrine is located at very narrow space in small area. As I did not have any other choice so visiting actually it. I visited there by my bicycle. At first I thought it was easy for me to find the shrine because I sometimes passed near the road of the shrine before. Getting there I checked the location of the shrine in details several time. However, I did not find the shrine finally. In my experience of over 300 times' visiting shrines for years. It is first for me. Many buildings have been constructed in the area and the town has changed completely. As I believe that such a sacred thing cannot be taken down easily even though it was the remains of shrine, I'll visit again and ask someone who living there.